Just think of the perch and toy creations you have room for with the high dome top! A cross perch and snuggly sleep tent up top can create a separate area for your wee one that will be appreciated. The tight dimensions of this cage makes it easy to move from room to room, or even outside with you. Dimensions with seed guard: 32 1/4" L x 30 1/4" W x 59 1/2"
Food/water cups "lock in" and cannot be removed by birds. 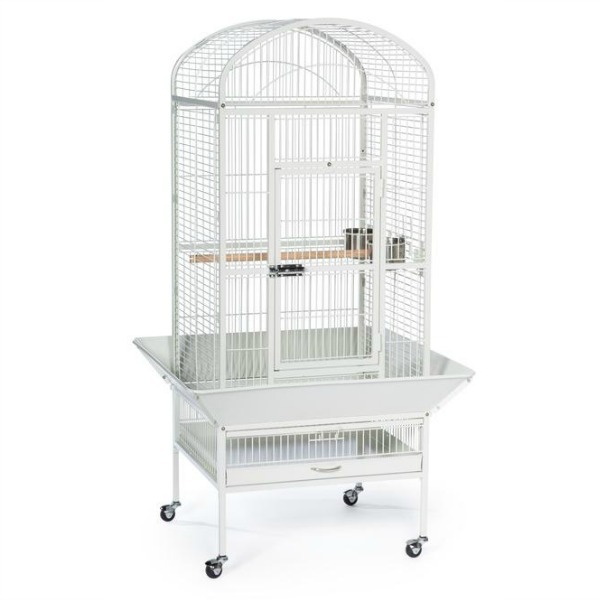 Expertly engineered in the US to be easily assembled and loaded with owner, and bird, friendly features, our wrought iron constructed cage offers quality craftsmanship at an affordable price. Rounded corner seed guards help control mess outside of the cage and are less likely to damage walls or catch on your clothing. Both grille and debris tray are removable for ease of cleaning and the integrated cage stand sits on sturdy, easy rolling casters. The large front access door measures 11 3/4'' long by 21 3/4’’ high and closes securely with a push button lock plus a windbell lock to prevent any escape artists from pushing the door open. Included with this cage are 2 stainless steel 24 oz. food/water cups, which lock into place within the 4’’ long by 6’’ high cup doors and a generously sized 7/8’’ wooden perch. Finished with a durable and elegant white hammertone powder coating, Prevue cages undergo independent lab testing and conform to the highest levels of pet safety.